For over a year now, the Boston neighborhood of West Roxbury has been leading a struggle to resist the building of the West Roxbury Lateral (WRL) high-pressure gas pipeline. This proposed pipeline is part of a massive expansion of pipeline capacity in the Northeast being pushed by Texas-based energy corporation Spectra Energy. A second energy giant Kinder Morgan is also building billions of dollars of unnecessary pipeline infrastructure throughout the region. 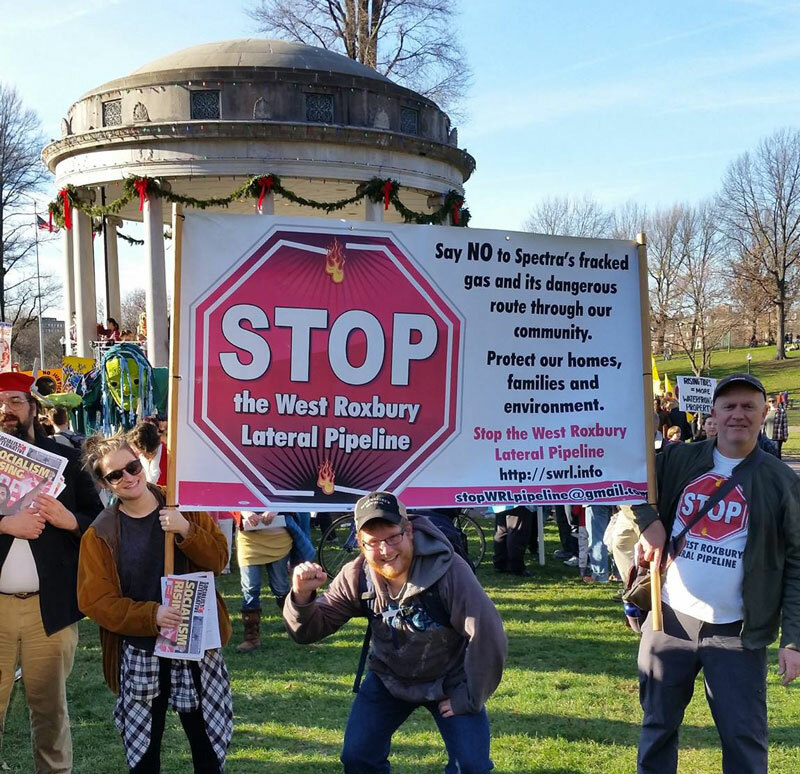 The grassroots community group leading the fight, Stop the West Roxbury Lateral Pipeline (SWRL), has scored several important victories lately which has turned the battle against WRL into a flashpoint for the wider struggle against corporate destruction of the planet in New England. The WRL pipeline is proposed to carry gas at pressures almost twice that of the pipeline that exploded in San Bruno CA which caused devastating destruction and fatalities to a suburban neighborhood in 2010. Moreover, the route proposed for the pipeline goes directly through major residential and commercial concentration, with a proposed metering and regulating station directly across the street from an actively blasting stone quarry. It’s estimated that if the pipeline explodes it will wipe out 30 blocks of West Roxbury. This would destroy scores of homes, several schools, and businesses, undoubtedly killing hundreds of residents and workers, including children, and contaminate a larger area of Greater Boston with the many radioactive and toxic compounds that would be part of a fracked gas inferno. Even if the pipeline manages to avoid an explosion, the health hazards associated with such projects are well documented. The Massachusetts Nurses Association, a union which represents over 17,000 nurses in the state, has led the way in the local labor movement in signing onto the cause, providing critical material resources to the Stop the West Roxbury Pipeline campaign. Massachusetts Teachers Association have now also given great support to the SWRL campaign. In a recent study, Massachusetts Attorney General Maura Healey also found that the main line being put forward by energy corporations like Spectra Energy, that there is a coming energy crisis, is false and that the expansion of new pipelines is actually the most expensive option when compared to the cheaper renewable alternatives. It is clear that what Socialist Alternative has been saying from the start, that the “crisis” was manufactured by big energy for the sake of profit, is true. Plans for the pipeline have shown that the overwhelming majority of this natural gas is not for local consumption, but for export at high prices to foreign markets. It will do little to nothing to benefit regular people around the pipeline economically but will endanger the health, safety, and the environment of the local community and region. The residents of West Roxbury are overwhelmingly opposed to the pipeline. Over a year ago, this mood coalesced into a neighborhood group called Stop the West Roxbury Lateral pipeline. Socialist Alternative members in the West Roxbury neighborhood played a critical role in turning it toward the mobilization of residents through canvassing and demonstrations. This led to meetings of hundreds to discuss opposing the pipeline. SWRL began holding rallies, marches, and vigils and putting local politicians on the spot at city government-sponsored meetings around city issues. This grassroots groundswell led to increased media coverage and the formation of similar groups in neighboring towns like Dedham. The Democratic Party, from its local city councilors to Boston Mayor Marty Walsh as well as our House and Senate representatives have been forced to reflect this growing community anger. However most of what they have put forward on this issue has been weak, ineffective token opposition. Often not even opposing the pipeline as such but objecting to “the process,” “the lack of communication to, and input from, the community.” Their “opposition” is often laced with comments that “We need the fracked gas. It’s a bridge fuel while we wait for future green renewable sources to develop and the pipeline is a done deal and there is nothing you can do about it.” The defeat of the Keystone pipeline as a result of mass, grassroots organized opposition against it and also the growth of other community campaigns like the one in West Roxbury gives us a different answer to how to defeat pipelines. In September, Spectra Energy took the City of Boston to court to push through the pipeline with their federal mandate. Boston responded with a counter-suit not pushing to cancel the project, but asking for a different route. This resulted in the Federal Court granting the right of imminent domain to Spectra Energy, a law previously only reserved for the government for infrastructure projects. Mayor Walsh could have instead put forward an appeal against the ruling while calling for the cancellation of the project altogether and also adding his critical support to the movement but chose not to. Walsh’s no show at the numerous rallies, meetings, vigils and action over the last year has not gone unnoticed by many residents and activists. The Local District City Councilor Matt O’Malley and the rest of Boston City Council has been similarly inactive, speaking on a few rare occasions at rallies but avoiding holding any city council meetings or hearings specifically on the pipeline. They have been in general missing in action and have refrained from taking any serious leading role in opposition to the pipeline. Once construction began, SWRL moved quickly build a wider coalition of support from West Roxbury residents, environmental and union activists that moved into direct action against the pipeline. At this point, dozens of people have been arrested slowing the pace of construction of the pipeline. Groups like Resist the Pipeline, chapters of 350.org, groups from the faith community and others played a great role in these actions alongside SWRL. Due to the cruel New England winters, exacerbated by climate change fueled by companies like Spectra, street digging for the pipeline was due to stop in mid-November. Under pressure from SWRL and allies, Spectra went home early with its tail between its legs! Vigils are continuing along the pipeline daily to protest off street construction that is still taking place. However, Spectra is planning to return on April 15. SWRL, Socialist Alternative are preparing for continued resistance once street digging begins, including a mass demonstration in March and several other events. Spectra Energy has admitted that the biggest problem they have faced to their plans to litter the region with pipelines has been the local community campaigns that have sprung up to oppose them. The West Roxbury campaign has proven to be one of the most determined and combative struggles against the fossil fuel industry’s destructive plans. Socialist Alternative argues that alliances and coalitions between other community campaigns, the environmental movement and labor unions need to be strengthened and expanded. Unaccountable Energy regulatory bodies like FERC and ISONE need to be scrapped, as they have been proved to be in the pockets of the fossil fuel industry and not people. They should be replaced by agencies that are democratically controlled and run by elected boards of energy workers and community. These agencies would organize and regulate energy in the public interest and rather than for private profiteering at our expense. The 99% should challenge establishment politicians that speak louder for big energy and the 1% than they do for ordinary people by running our own candidates against them. This could serve as a basis for a new party of the 99%, independent of big business. Ultimately, the system of capitalism which places private profits before the future of our planet and the safety of our communities is proving to be a dead end system of the past. Instead of for-profit pipelines, we need a system that can plan a future for working people based on clean energy and sustainable union jobs for all workers. Only a socialist system based on democratic planning can show a way out of the crisis, based on public need, not corporate greed.